Ductus arteriosus aneurysm is a rare clinical entity in adults, and less than 50 cases have been reported till date. In adults, aneurysm of the ductus arteriosus may be congenital or acquired through surgery. Patients with ductus arteriosus aneurysm become symptomatic secondary to the pressure of the aneurysm on the surrounding structures. When ductus arteriosus aneurysm impinges on the recurrent laryngeal nerve it may cause hoarseness of voice (Ortner’s syndrome). We here present a rare case of adult ductus arteriosus aneurysm that presented as hoarseness of voice. The diagnosis was established with the help of magnetic resonance angiography; surgical resection of the ductus arteriosus aneurysm led to complete resolution of symptoms. A 28 year-old-male patient presented with gradual onset of the hoarseness of voice since three months. The hoarseness of voice was not associated fever, sore throat, and cough. His vitals and physical examination including ear, nose and throat examination were normal. Radiography of neck and chest were normal. A direct flexible laryngoscopy revealed normal vocal cords. Patient was empirically treated with “a course of antibiotics”. However, as patient’s hoarseness of voice persisted a computed tomography of the chest was obtained that revealed an abnormal blood vessel in the aortopulmonary window. Magnetic resonance angiography of the chest obtained subsequently revealed a large aneurysm of the ductus arteriosus (Image 1 and 2) compressing on his left recurrent laryngeal nerve. Figure 2. 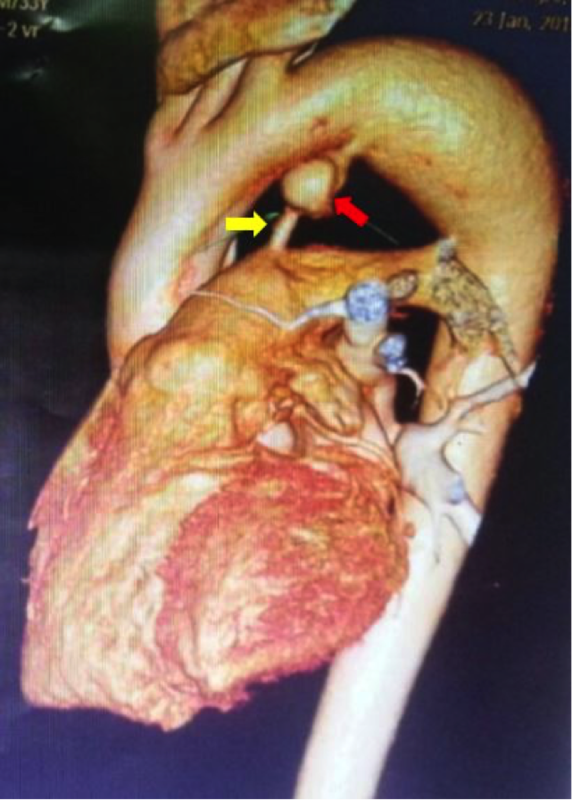 Magnetic resonance angiography of the heart (lateral view) showing patent ductus arteriosus (indicated by yellow arrow) and ductus arteriosus aneurysm (red arrow). Ductus arteriosus aneurysm (DAA) was considered for surgical resection following ligation at both the ends of the ductus arteriosus on cardiopulmonary bypass. Intraoperative, a large DAA impinging on the left recurrent laryngeal nerve was noted. The aneurysmal sac contained thrombus (Image 3), thrombectomy was performed. Intra and post-operative course was uneventful. Patient was followed up; he reported improvement in his hoarseness of voice and regained the normal texture of his voice six months following the surgery. A repeat computed tomography of the chest complete regression of aneurysmal sac was noted. Figure 3. 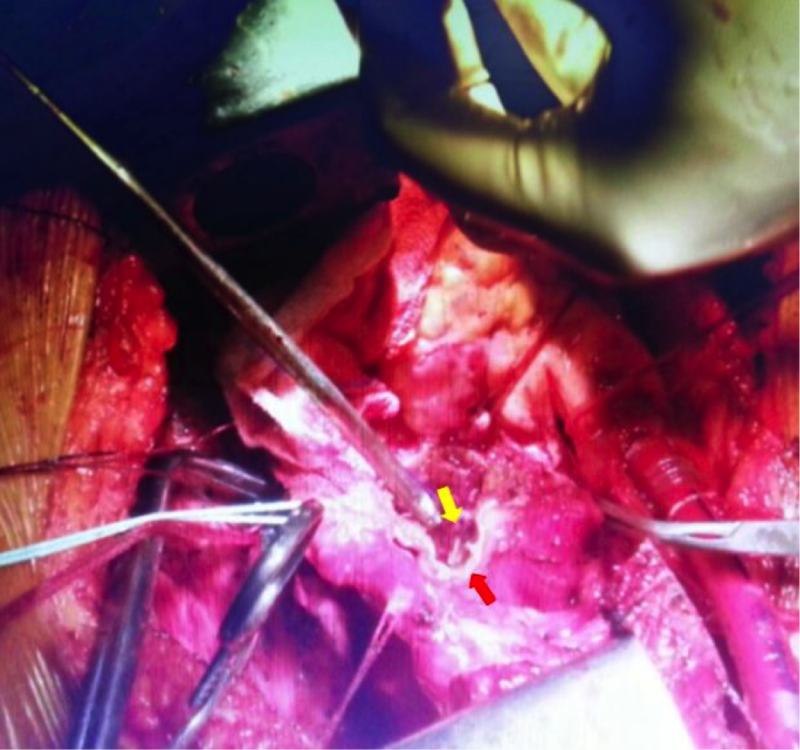 Intraoperative picture of ductus arteriosus aneurysm (red arrow) resection. 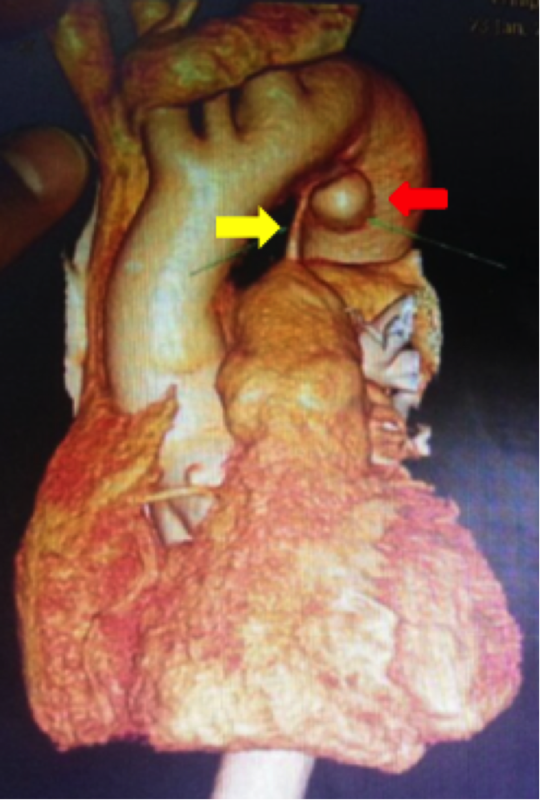 Intra-aneurysmal thrombus is seen in the image (yellow arrow). Ductus arteriosus (DA) is a normal and essential anatomical shunt that shunts blood from pulmonary circulation to systemic circulation during fetal life. The low oxygen tension and the local synthesis of prostaglandin-E2 (PGE2) and prostaglandin-I2 (PGI2) keep the ductus arteriosus patent. The physiological changes that happen soon after the birth such as (i) increase in the oxygen tension leads to the inhibition of the voltage-dependent potassium channels in the vascular smooth muscle and the resultant calcium influx induced smooth muscle contraction and (ii) increased degradation of PGE2 and PGI2 as lung becomes functional, contributes to patent ductus arteriosus (PDA) closure . The incidence including both symptomatic and asymptomatic cases of PDA is 1 in 500 . Aneurysms of the ductus arteriosus in adults can be spontaneous or secondary to surgery . Adult angiographic studies show an indentation of the aortic wall often referred to as “ductal bump” or “ductal diverticulum” at the site of insertion of the obliterated ductus arteriosus in 9-26% of the studies . A varying prevalence of congenital DAA has been reported in the pediatric population. A neonatal autopsy study in 1850 reported a prevalence of 0.8% , while a retrospective analysis of neonatal chest radiographs found the “ductal bump” in 1% . An echocardiographic longitudinal study reported a much higher incidence of congenital DAA at 2.2% in fetuses at 32 weeks of gestation  and a much higher prevalence of 8.8% in neonates was found in an ultrasound study . The increase in the reported prevalence can be partly attributed to better imaging modalities and their wider application these days; also Jan et al concluded that the absence of complications with congenital DAA may be another contributing cause . Till date only 35 cases of spontaneous DAA has been reported in adults [9, 10]. Pathogenesis of congenital ductus arteriosus aneurysm (DAA) origin is not clearly understood. Obliteration of ductus arteriosus starts from pulmonary artery and towards the aorta. At times complete obliteration of the ductus arteriosus fails to happen in the aortic end, in such cases ductus arteriosus may persist as an aortic diverticulum. This aortic diverticulum when exposed to high arterial blood pressure in the aorta may develop an aneurysm. Degeneration of tunica media has been noted in ductus arteriosus that develop aneurysm . Abnormal intimal cushion formation and abnormal elastin deposition have also been attributed to congenital DAA formation . Jan et al have noted higher incidence of DAA in neonates of diabetic mothers . Circulating factors in diabetic mothers are thought alter not only the fetal or placental circulation but expression of intimal cushion and extracellular matrix in DA . Jan et al also noted the higher prevalence of blood group A in mothers of neonates with DAA . This association is likely beyond mere presence or absence of blood group antigens and/or antibodies. It is thought that other biological roles of blood group antigens such as adhesion molecules, enzymes, receptors, transporters and channels may possibly have a role. Also, the genetic link between DAA and blood groups is yet to be explored . DAA has been reported in patients with connective tissue disorders like Marfan’s syndrome and Ehlers-Danlos syndrome [13, 14]. DAA may be an asymptomatic incidental finding on imaging. Large DAA may produce symptoms secondary to compression of the surrounding vascular, neuronal and non-vascular structures . Ortner’s syndrome is hoarseness of voice secondary to compression of recurrent laryngeal nerve in aortopulmonary window by cardiopulmonary causes . Ortner’s syndrome can develop secondary to DAA. Spontaneous rupture of DAA may happen and often carry grave consequences. DAA may harbor thrombus that may extend to pulmonary artery or aorta and thus result in thromboembolism . The incidence of such complication in adult DAA is not known due to the rarity of the condition. A retrospective analysis of neonatal DAA found complications in 3 out of 24 patients, six other patients with large DAA had early surgical resection to prevent complications . DAA in adult can be detected on chest radiographs, computed tomography with contrast and magnetic resonance imaging  ; computed tomography angiography remains the diagnostic investigation of choice . In computed tomography axial imaging through aorticopulmonary window, DAA is noted as the third blood vessel which shows arterial phase contrast apart from the ascending and the descending aorta. This radiological sign is referred to as “triple star sign” . Ductal diverticulum often referred to as ductal bump on chest radiography may be wrongly diagnosed as DAA . Common complications associated with DAA are thromboembolism, erosion into surrounding mediastinal structures, endocarditis, rupture, and death [2, 12]. Specific guidelines for management of DAA do not exist. Based on their experience and through literature review Dyamenahalli et al recommend surgical correction of DAA if patient has any of the following: i) a PDA and DAA beyond the newborn period, ii) DAA associated with connective tissue disorders, iii) a thrombus noted in DAA with extension into aorta or pulmonary artery, iv) evidence of thromboembolism, v) DAA comporting function of the surrounding structures vi) a huge DAA . Surgical resection of the DAA on cardiopulmonary bypass is preferred care in these patients over simple ligation of the PDA as simple ligation is associated with the risk of incomplete closure and intraoperative and postoperative aneurysmal rupture . We here present a rare case of adult ductus arteriosus aneurysm that presented with Ortner’s syndrome. The rarity of the condition with the non-specific symptoms makes it difficult to diagnose the condition. DAA in the case presented was resected under cardiopulmonary bypass, following which the hoarseness of patient’s voice resolved promptly. DAA is a rare clinical entity in adult; less than 50 cases have been reported. DAA usually presents with pressure symptoms on adjacent structures or it may be an incidental finding on the radiological imaging. Rupture, endocarditis, thromboembolism are dreaded complications associated with DAA. Computed tomography angiography is the imaging study of choice. Surgical resection of the DAA on cardiopulmonary bypass is the treatment of choice for large or complicated DAA. Thore J. De l’anévrisme du canal artériel. Arch Gen Med (Paris) 1850;23-30. Ortner N. Recurrenslühmung bei Mitralstenose. Wien Klin Wochenschr. 1897;10:753–5. Addams-Williams JH, Collin N, Agrawal N, Armstrong S, Tierney P. The Internet Journal of Otorhinolaryngology. 2005; 4:2.